There’s so much information available about conservatories that it can be quite overwhelming if you’re beginning to think about improving your home. With this in mind, here is a simple guide to everything you need to know about conservatories! Put simply, a conservatory is a room made up of glazed sides and a glazed roof, attached to the side of a house. Conservatories come in a variety of different shapes, styles and colours. They are also made in a variety of different materials; the most popular being uPVC, timber and aluminium. What can you use a conservatory for? Conservatories can be used for all sorts of purposes, ranging from dining rooms and offices, to play rooms and quiet spaces. Thanks to the increased natural light that they can let into a property, and the fantastic views of your garden that they can provide, conservatories are the perfect place to enjoy the outside from the confines of your own home. What’s more, with modern high performance double glazing (which we supply as standard with all of our conservatories here at Albany) you can use your conservatory all year round: from the height of summer, to the depths of winter. Dating from the 16th century, conservatories were originally used as places to keep citrus trees and other exotic plants during the winter. The large panes of expensive plate glass used in early conservatory design meant that conservatories were only really within the financial reach of the richest people in society. During the Victorian period, conservatories began to evolve from their use solely as winter greenhouses. They steadily began to take on more of a social function in the Upper/Middle class Victorian family life, and were used as a location for taking tea with friends, and for dinner parties; surrounded by strange plants gathered from the British Empire. 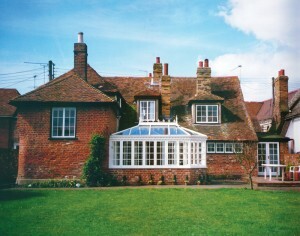 After the First World War, with the development of glazing technology, conservatories began to become more affordable and available in other materials such as steel and aluminium. With the invention of uPVC, conservatories became well within the price range of most households. Over the last century, conservatories have become a popular feature of homes across the country for all different kinds of people and families. When it comes to designs, conservatories are available in a huge range of different styles. The most popular are Victorian, Edwardian, Gable and Lean-to. Victorian conservatory styles are characterised by their elegant structure, intricate detailing and ornamentation, and Edwardian styles by their large, rectangular glazing panes. These two designs are considered period styles and are best suited to properties with traditional aesthetics. Gable and Lean-to conservatory styles on the other hand, are considered more contemporary and are suited to modern look properties. A Gable conservatory is characterised by an impressive, high sloping roof and the Lean-to conservatory by its large glazed areas and huge footprint. On top of these popular designs, there are also hybrid styles such as P-shaped and T-shaped conservatories, and many conservatory installers can even create bespoke conservatories so that you can customise its appearance and structure even further. You can see more pictures of conservatories in our gallery. If you’re thinking about improving your home with a conservatory, we offer a huge range of conservatories, including Victorian, Edwardian, Gable, Lean-to, Loggia and Double-Hipped styles. This entry was posted in Conservatories.